First of all, we are pleased to announce our new Little Every Week Share. Up ‘til now our “Half Share” option has meant picking up every-other week, and picking up the same amount as the every-week or “Full Share” folks. Some of you have asked about coming every week and taking a smaller amount. We’ve listened to your suggestions, and we’ve added this new format that we’re calling the “Little Every Week share”. To go along with this change, we’ve renamed the other two share options to “Big Every Week share” and “Big Every-Other Week share.” With the Little Every Week share, members will pick up every week, but they will receive a little less than half the amount of the folks with Big shares. …with the Big shares being a little more than twice the amount of the Little share. In the past week sign-ups have increased dramatically, so be sure to register soon to reserve your spot with us this season. You can find our updated share information page here. 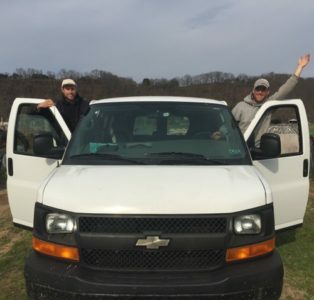 In other farm news, we are happy to introduce our newest piece of farm equipment, this shiny 2007 Chevy Express Van. Our old, though well-loved, two-tone Ford Lariat was unable to pass inspection last year, so we acquired the van from a place in New York appropriately called VANSVANSVANS. With the van we have more volunteer & employee seating, as well as greater capacity for hauling the veggies from field to cooler. We’re already benefiting from this new reliable tool, picking up farm supplies and driving around the farm to work on Spring Projects. 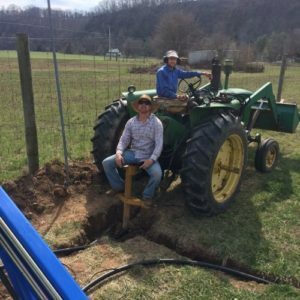 Speaking of Spring projects, those of you who follow us on Facebook or Instagram have seen photos of us working on a new semi-permanent, underground irrigation system. Our old system served us well for 4 seasons, but after 2 notably dry Springs we were ready to upgrade to something that will make our lives easier. In the past we had to drag 300 feet of blue layflat hose and connect it to our aluminum pipes. Note the expression on farmer John’s nephew’s face reflecting how much we enjoyed that extra labor. 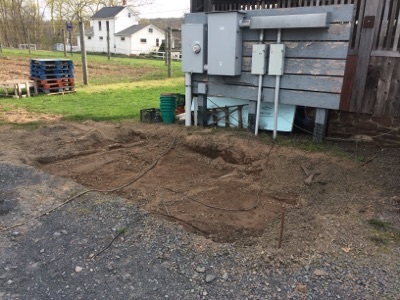 With the new system, we’ll have underground valve boxes every 100 feet in the headspace between our fields, so we should never have to deal with more than 80 feet of above-ground hose at a time. 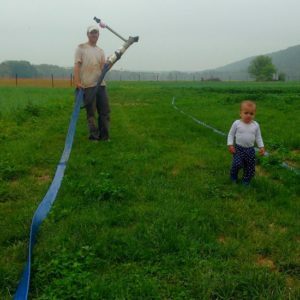 Now with a more manageable length of hose to move from one valved irrigation box to another, we can efficiently water our crops through any future dry spells. Just yesterday, April 12th, we showed off our new irrigation boxes to Delaware Valley University students studying Commercial Vegetable Production. After the class left, we made the final connections in the new system of pipes and were able to water our new onion transplants by the end of the day. Pretty exciting for us! We’d like to give a shout out to our new Field Helper, Becca, who helped us with digging in the new lines. And we’d like to thank Jamie M. from Rolling Harvest Food Rescue for the same assistance. Last but not least, we are thankful for Craig Schneiderwind’s help on the project, here featured weighing down the line for the great dig. The final Spring project is a new walk-in cooler, which is currently in its groundbreaking stages. Here you can see the actual hole in the ground where the foundation is to be poured this week. This cooler project has been in the works since last year, and we’re excited to see it through in the coming weeks. The new cooler is going to provide the Schneiderwind farm staff with more conveniently located cold storage, and allow us to almost double our cold storage space in the cooler trailer we already use. Working with our landlord, Craig, has been one of the joys of farming on this land, in part because of how easy it is to collaborate with him on farm improvements like this one. 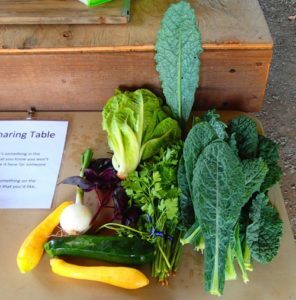 We hope all of our Tinicum CSA community is doing well and enjoying the lovely spring days … and looking forward to some crisp, mouth-watering veggies in the coming months!